We had a very full weekend. Friday night, we met our friends Brooke and Warren for dinner and a movie. A Buffalo Wild Wings just opened this week in our town, and we had dinner there. It was good and (surprisingly) the service was good. I hate going to new places when they first open…but it was good. We saw the Dark Knight Rises. It was good, but a little long. I also gave them the baby quilt I made! Their sweet baby Parker is due next month! 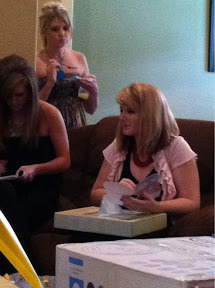 Saturday, I cleaned all morning, then headed a few towns north to Brooke’s hometown for her baby shower! Look at that cute cake! It matches her nursery, brown/green/blue with fish. 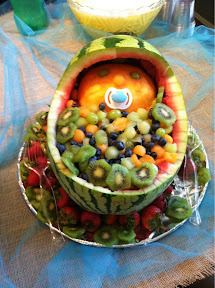 Her mom made this cute fruit salad! She looked so beautiful and was showered with so much love! Sweet baby Parker has the best village looking forward to raising him! After the baby shower, I headed to Sunny’s house. Sunny is a Zumba instructor friend who lives in my town. We had a little get together at her house. We ate, talked, tried on each other’s Zumba clothes, and made up some dances. Sunny has a HUGE Great Dane Forrester. He was 160 pounds! 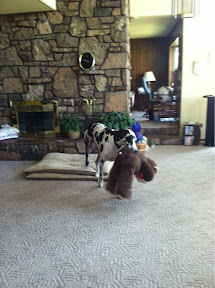 His toy was a full size stuffed animal! Forester didn’t mind us at all! We were dancing in the living room making up some Zumba songs together and he just chilled in the middle of us! Today was a day filled with church. I sang at all three services, so I was at church from 8-noon. I sang one of my favorite songs, “Call on Jesus” I made it through the first two services fine, but in the third one, I noticed lots of my friends worshipping and tearing up, and then I noticed my daddy crying. I lost it. I cried through the whole last chorus. But its ok. It is my heart for the Lord and His faithfulness. I wish I could have finished the song stronger, but I know the Lord was glorified, and not me…which is always my prayer when I sing. We ate lunch and I came home and napped. I just ran around too much this weekend. I was worn out. I took a nap on and off for hours. And it was glorious. Are you excited about the Olympics? Did you have a good weekend? Have you ever seen a dog that big? Love the quilt, you are so talented! 🙂 Thanks girl! I’ll make you one someday! 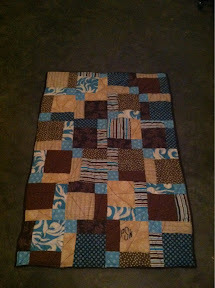 I am really enjoying the baby quilts! Seriously…that quilt! DANG GIRL!-IMPRESSIVE! 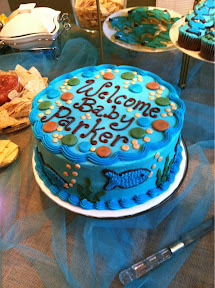 =) I didn’t know Parker was due NEXT month! So soon…times flies! I know! We had lunch with them right after they found out, and I can’t believe it has been that long ago! Your blog is very cute! 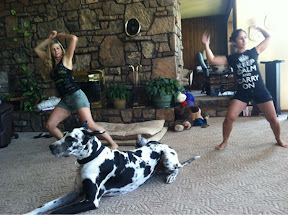 Enjoying reading a bit about your journey and Zumba – fun stuff. Congratulations on your transition!